A downtown high-rise condominium building, converted to rentals during the recession, is heading back to the market later this month. Brett Le Blanc/Las Vegas Business Press The Juhl in downtown Las Vegas. The Juhl, a 344-unit, multibuilding community that spans a city block in downtown Las Vegas, will start selling in the high-$100,000 range in April. Floor plans at the property range from 600 to just under 2,000 square feet. The property contains more than 130 unique floor plans, according to a written statement from KRE Capital. The community also contains high-rise, mid-rise, brownstones and live-work options, retail space and a warehouse-style loft building. Vaknin said Juhl’s current residents were given the first option to purchase units. Vaknin added that interest by prospective buyers in the property has been high over the last few years. There is a wait list of about 120 non-resident prospects, he said. KRE purchased Juhl, along with several other luxury condo communities across the valley in 2013, for $237 million: Loft 5, One Las Vegas, Spanish Palms and The Ogden were also included. KRE purchased the portfolio, which included Juhl and The Ogden, once known as Streamline Tower, from a partnership between the Federal Deposit Insurance Corp. and ST Residential, a division of Starwood Hotel Group. ST Residential and its partner formed to take over 100 troubled loans in 2009 from failed lender Corus Bank’s properties, which were scattered across the U.S., including in Las Vegas. When KRE made the acquisition, Juhl, which sits at 353 E. Bonneville Ave., between Third and Fourth Streets, was already 11 percent sold, leaving 306 units left for rentals. The property opened for sales in 2009. Prior to the recession, nearly 12,800 condos and condo-hotel units were constructed on or near the Strip and downtown. When the housing market fell, the values of these condos fell dramatically. In response, many homebuyers at that time tried to get out of closing on the property and getting their deposits returned, much of it leading to litigation over tens of millions of dollars in deposits. Following the shakeup, Juhl has transformed into a viable asset, attracting professionals and entrepreneurs, including those who work at law firms and courthouses in the downtown area. Juhl also has been attracting more of this crowd with the opening of the Promenade at Juhl, a 20,000-square-foot retail space. Seven of the eight available spaces are open including Greens &Proteins, Le Pho, A/V Boutique, Downtown Décor, Jaeci, Galerie Miscre8 and Get a Haircut. Opening soon is The Corner Market. Juhl has Veterans Affairs approval for financing, which allows eligible buyers to get 100 percent financing. There are also conventional loan options, along with those for investors. “Our diversified loan options make it possible for almost all qualified buyers to purchase at Juhl,” Vaknin said. The building has about a 95 percent occupancy rate. Management plans to list units for sale as leases expire but will extend some to keep vacancy down. KRE’s sister property, the 275-unit, 21-story The Ogden high-rise building at 150 Las Vegas Blvd. has been on the market for some time. In its first year on the market in 2008, only 10 percent of The Ogden’s available units sold. The building is now more than 50 percent sold; 116 units are left to sell out of the 250 KRE originally acquired. 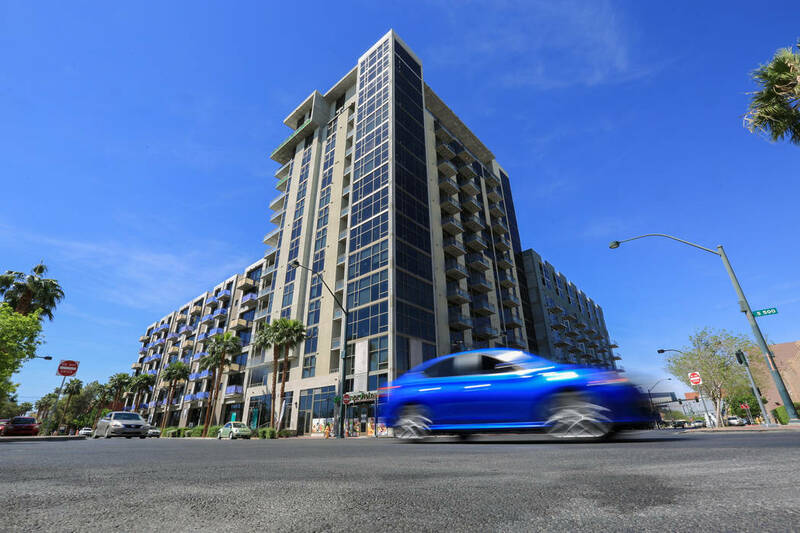 According to data from the Greater Las Vegas Association of Realtors, the number of high-rise units sold in the valley has been increasing over the last three years. In 2014, there were 636 high-rise units sold; the following year 734 high-rise units were sold, as tracked through the GLVAR’s multiple listing service. In 2016, there were 820 units moved. Median price, however, has been going down during the same period. Median price on high-rises sold in 2014 was $299,500 compared to 2016’s $259,950 median sales price, according to data from GLVAR.